As some of you may know, the NYC Department of Education (DOE) announced in December that they plan on closing 14 schools- two of which are on the Rockaway Peninsula, PS/MS 42 and MS 53. Since becoming the assemblywoman for this community, I have been a strong advocate for education and have worked with the DOE on numerous issues, however not one included the potential closure of schools within my district. As a native of Far Rockaway, and a graduate of then IS 53, I am extremely disappointed in the DOE’s lack of communication with parents, students, and myself. There has been tremendous community support against the closure of both schools. While my Assembly District only encompasses MS 53, many constituents (school staff and students) are also affected by the possible closure of PS/MS 42. My office has been inundated with phone calls from teachers, students, and parents alike requesting to stop the closure of these schools. In addition, hundreds attended the public hearings, myself included, to voice their concerns about the proposed closures. Sitting at the hearings and listening to the passion behind the students and teachers only affirms that the DOE has got it all wrong. The closure of a school places hardships on students that should never be a student’s concern. As a former PA president, I can attest that trying to solve the myriad challenges of education is hard enough on students, teachers and families, without the possibility of closing a school where they have learned and felt safe for years. The fact is both schools have grown as renewal schools; they should have been compared to other focus schools in focused districts as opposed to the city as a whole. Specifically, MS 53 has met many of their bench marks and has had great success while still facing MANY obstacles of students who are: 67 percent economically disadvantaged, 20 percent English Language Learners (ELL), and 37 percent of students with learning disabilities. The DOE must continue to invest in our existing neighborhood schools to both ensure full growth in our students and our surrounding community. 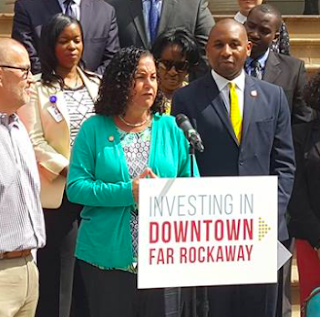 With the expected downtown Far Rockaway city investment we know we are going to grow-why close a school when we should be investing now? It’s obvious city agencies don’t communicate. This past Friday I wrote to Chancellor Fariña and the Panel for Education Policy (PEP) requesting that the decision to close MS 53 is rescinded from the PEP meeting on Feb. 28, and is reevaluated. These are our children, and their education is worth fighting for. As we are just beginning this year my goal is to not only continue to fight on behalf of our community, but to continue the relentless constituent service, legislative advocacy, and community problem-solving that myself and my team has strived for over the past year. This is an amazing community, like no other in the world. I am so lucky to be raising my children here with my husband. The diverse and beautiful peninsula we call home deserves all the hard work, energy and vision we can muster. Please let me know how I can help, what concerns you have, and what your ideas are for the future. I have a feeling we’re going to do great things together in 2018.